Pivoting Fence for Supporting Larger Stock. Built in fluorescent light illuminates cutting edge. Powerful 15 AMP motor for improved performance; 4,600 RPM. Dual post compound pivoting arm. Bevel cuts up to 45° to the left. 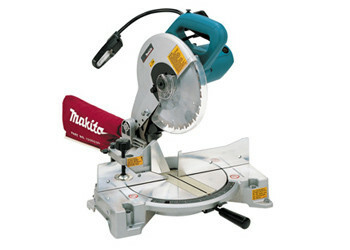 Miter cuts 0-45° left and 0-52° right. Positive stops at 9 settings; 15°, 22.5°, 30°, 45°, right or left and 0° (90° cuts). Weighs only 24.2 lbs. for easy portability. Precision machined aluminum base ensures accurate cuts. Shaft lock for easy blade changes. Includes 10" 40 tooth carbide tipped blade.